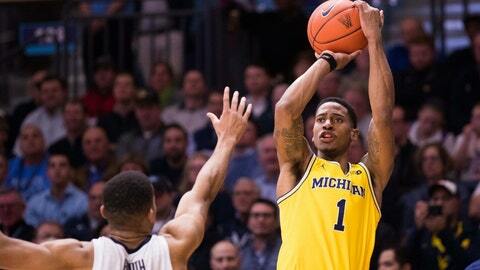 Charles Matthews leads the Wolverines with 19 points. Matthews scored 19 points, Ignas Brazdeikis had 18 and No. 18 Michigan beat No. 8 Villanova 73-46 Wednesday night in their first meeting since last season’s national championship game. The Wildcats couldn’t make any push in the second half, and fans hit the road early. “They executed way better than we were prepared to play defense,” Booth said. Neither team looked like the two squads who met in San Antonio seven months ago. Villanova lost four players who were drafted in the first 33 picks of the NBA draft. AP Player of the Year Jalen Brunson plays for the Dallas Mavericks. Omari Spellman is with the Atlanta Hawks. Mikal Bridges landed in Phoenix after a draft-night trade with the 76ers, and Donte DiVincenzo — who scored 31 points in the title game — is with the Milwaukee Bucks. Michigan lost three of its top four scorers. Moe Wagner, the star big man, was drafted by the Lakers in the first round and is playing in Germany. Duncan Robinson and Muhammad-Ali Abdur-Rahkman graduated. Brazdeikis’ teammates love his attitude and confidence on the floor. “Iggy is like a mean pit bull,” Simpson said. Bill Finneran, the Villanova alum who was the lead donor for the school’s on-campus court that underwent a $65 million face-lift, was honored at halftime. “The worst game you’re going to see here,” Finneran told the crowd. Michigan: Brazdeikis showed he can score against tough competition, performing well against top defender Paschall. Brazdeikis and Matthews give the Wolverines a formidable wing duo going forward. Villanova: Showed its youth, giving Wright plenty of teaching points. The Wildcats relied on 3s the first two games, taking more shot attempts from beyond the arc than inside. They couldn’t get them to fall from long range, going 3 for 15. Michigan hosts George Washington on Saturday. Villanova hosts Furman on Saturday.